My obsession with all things banana is well known, my obsession with peanut butter is also pretty well known but one obsession that is not well know is that, yes I am a carrot cake snob! There I have said it. I’m really picky about carrot cake, I love it and adore it but I’m fussy as anything about it, the amount of times I have had to suffer the injustice of eating a dry, sawdust texture carrot cake is unbelievable. Hence why I now tend to stay away from it in coffee shops as its just never good enough. 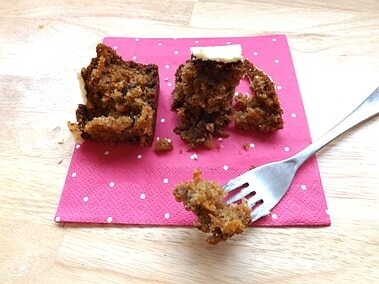 Don’t get me wrong I have also had some heavenly carrot cake in cafes that just melt in your mouth. But homemade is always better. Having collected a bunch of carrot cake recipes over the years I decided it was time to actually put some of them to the test. 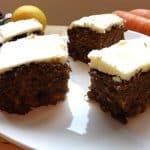 Carrot cake recipes can vary so wildly its unbelievable, some have pineapple in them, some have walnuts, some have grated apple and some have a bunch of spices in them. I took what I thought looked like 2 really good recipes and decided to battle it out between them. Both cakes were nice, but to decide the winner I waited until day 2, after all what good is a cake if by day 2 you have to throw it away because its too stale, because even I have trouble eating a whole cake in one day. The one for me that was the winner was still really moist and moreish the following day and it tasted great on day 3 as well. Bonus! It hasn’t lasted beyond 3 days with me around but I seriously believe it would last up to at least 5 days in an airtight container. 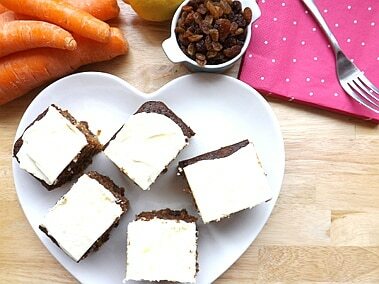 The winning recipe is from the hedge combers blog they claim it to be the best ever carrot cake so when I saw this claim I definitely had to test it out. 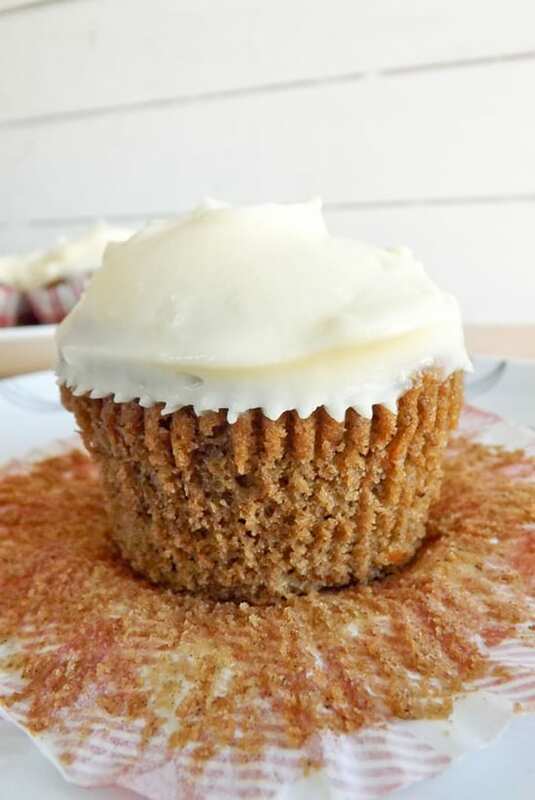 I did deviate from the original recipe just a little; instead of using caster sugar I used light brown sugar instead it’s just what I had on hand and I like brown sugar in these kinds of recipes. 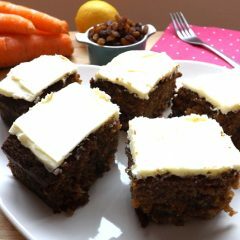 I also added a few sultanas, for no other reason then I like them in carrot cake. Because I used brown sugar I think mine turned out a little darker then the original, but you know what? 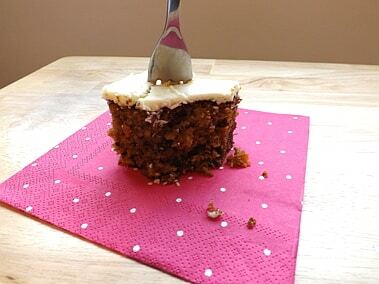 This is a really good carrot cake, moist and sweet and if you wanted to cut down on a few of the calories you could quite easily eat this without any frosting. Janie who runs the hedge combers blog also put a lemon buttercream on hers so I decided to follow suit, I like cream cheese frosting but it I wanted to stick to the original as much as possible. And the chopped dates in this are sublime I love dates in cooking they are so sticky and sweet and the chopped hazelnuts add a lovely little crunchy texture as well. 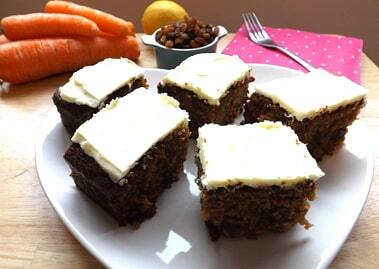 A sweet moist carrot cake with a lovely fresh lemon frosting. Preheat your oven to 180C / 350F/ Gas mark 4. 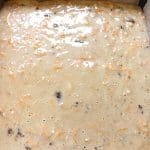 Grease or line a 7inch x 7inch square tin. 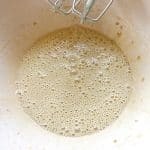 Whisk the sugar, oil and eggs together in a large bowl. 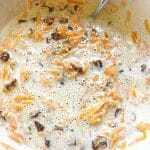 Add the grated carrot, dates, sultanas and chopped hazelnuts and orange zest mix well. Sieve the flour, baking soda, and ground cinnamon in and mix well, once fully combined transfer to your baking tin. Pop in your preheated oven for 40 – 45 minutes or until baked and a skewer come out clean from the middle. Leave to cool in its tin for 10 minutes, then transfer to a cooling rack to fully cool. Beat the butter till it is light and fluffy. Add the icing sugar in slowly and mix. 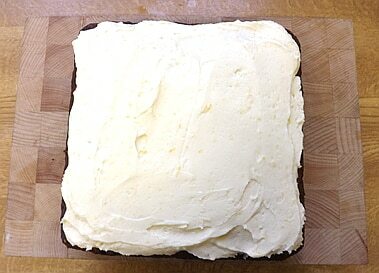 Add in the zest and juice from the 1/2 of lemon and stir in until you have a light fluffy buttercream. 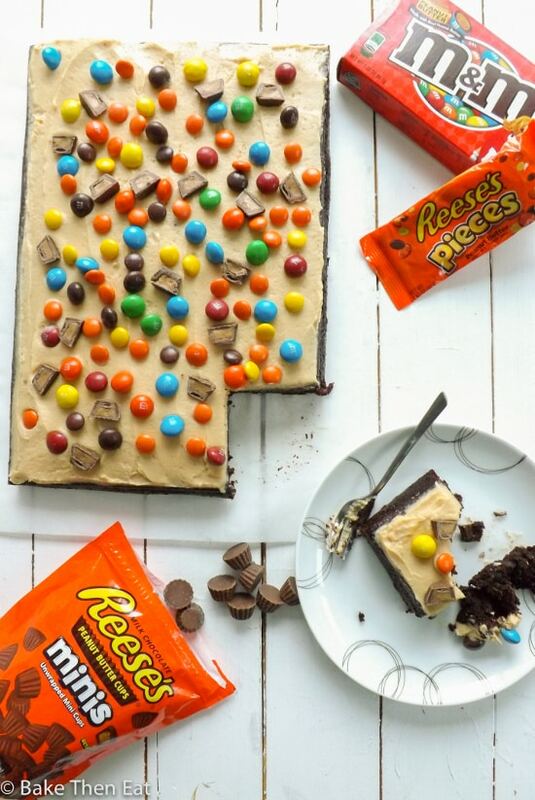 Spread generously over the cake. Cut up into squares and serve. 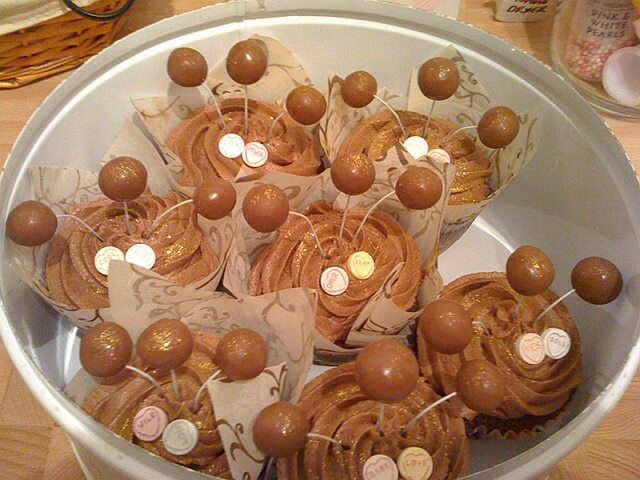 I’m so glad you liked it, and isn’t it lush with the lemon frosting! Thank you so much, and you’ve reminded me how much we enjoyed this cake first time round, I may have to bake another this weekend! This looks like a winner. Ill give it a try. Thanks Stacy I’m sure you’ll love it. 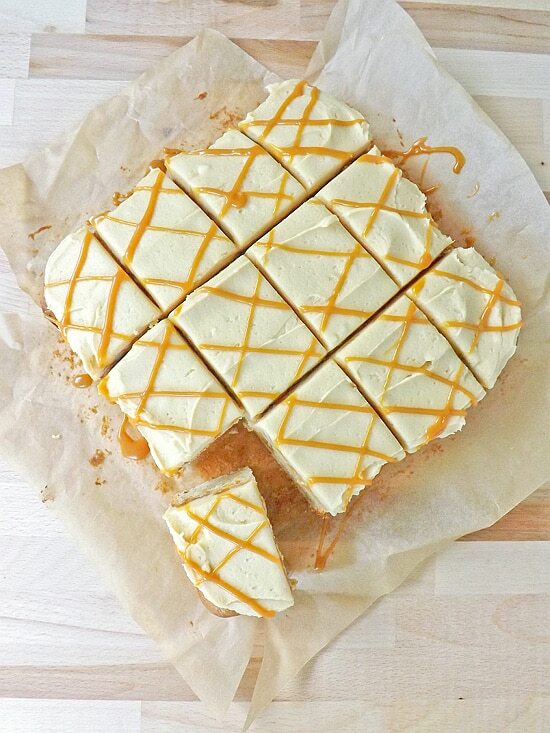 My dad is a huge carrot cake fan and this cake looks fabulous! 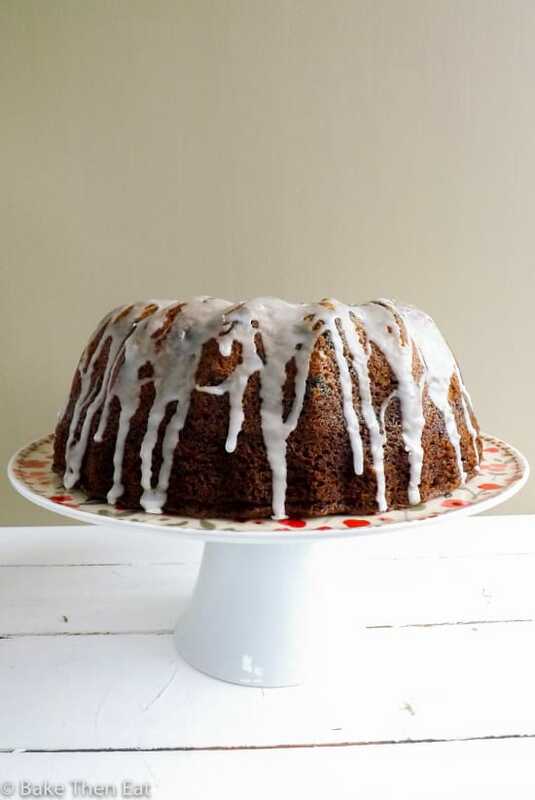 Love moist carrot cakes so need to add this to my list the next time I make carrot cake for him, thanks for sharing Emma!